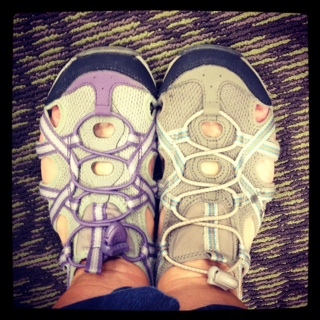 While shopping out-of-town last week, I looked down and noticed…that I was wearing two different shoes. This is isn’t your “Oopsy! I am wearing a dark blue shoe and a black shoe” mix up! They were completely different colors! Yes, the style was the same…but look at them! AND YES! …I know that some of you think that having the same shoe in two different colors is another problem in and of itself, but my motto is …. “If you like it, buy it in several different colors!” It works for me, or rather it did until my shoe snafu. Personally, it’s funny. How often do we do mindless things, and then wonder how in the world we could ever have made that crazy brainless mistake? Well, my sweet hubby and I became so tickled when we realized my dilemma that we had to leave the store. Doubled over in tears, I can only imagine what people must have thought.